The huge bulk of this 1861 church comes as some surprise in the pleasant terraced streets between Unthank Road and Newmarket Road. 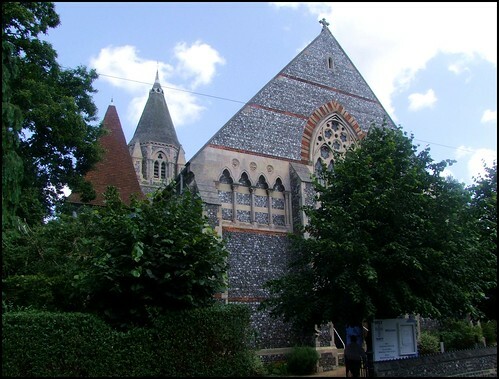 Holy Trinity is a short walk from the city centre, but it is hidden from view by the blocks of flats of Chapelfield. The design was by William Smith, a notable London architect, although his only other work in Norfolk is the rather elegant little church at Fulmodeston of a couple of decades later. Nobody could accuse Holy Trinity of elegance, but it is certainly splendid. The great tower rises to an octagonal bell stage before being topped off at 40m with a somewhat disproportionate octagonal spire with eight lucarnes. Smith seems to have shoe-horned this massive church into its narrow site, and it is a difficult building to see from a distance. It is is the biggest Victorian church in Norwich, and was designed to hold a thousand people. It is the only cruciform church with a central tower in the city, other than the two cathedrals. 1861 is far too early for the later Anglo-catholic enthusiasms of the city, and Holy Trinity was an evangelical barn from the start. A mark that it has continued in this tradition can be seen as you enter the church from the west, for the entire western half of the nave has been glazed in under a ceiling to create a meeting room as big as the church beyond. On the walls are bold statements about Holy Trinity's church-planting plans. You step through into the cool, dark openness of the church beyond, and when you turn around you can see that, above the meeting room, there is a vast raked area of seating, as if this was a grand cinema. It dates from the 1990s. The caretaker told me that the old west gallery, which was much smaller, had been glazed in to provide a library, and its replacement by the new arrangement had caused some controversy. The new gallery is certainly spectacular, and they seem to have reused the original seating up there, replacing it at floor level with modern cushioned chairs. Above, the roof is like looking up into the superstructure of a huge, upturned boat. The brick-banded walls were whitewashed at some point, probably in the 1960s. A considerable amount of stained glass survives, not all of it good, but the Transfiguration in the south transept east window is striking, and there is some good J & J King glass in the apse. I rather like the scene of Christ welcoming the children, in which he looks slightly overwhelmed. Better still is the Faith, Hope and Charity in the north transept, (could it date from the early 20th Century?) but it was too dark for me to photograph it properly. Nearby, there is a rather garishly painted font, which may give some clue as to the original decoration of the church, and a plaque to George Hoste, the Rector who was responsible for the building of this great pile.